Learning guitar on your own can be challenging and immensely rewarding. There are a few skills that will help beginner guitarists on their musical journey, and reading a chord chart is one of them. Chord charts map out finger placements for chords. Chord charts are used on their own, so players can learn variations of major and minor chords, but are also sometimes used in conjunction with guitar tablature or sheet music. A chord chart is a map of the guitar’s fret board with dots indicating where your fingers should go to play the chord in the chart. Let’s look at this chart below, which illustrates how to form a C major chord. 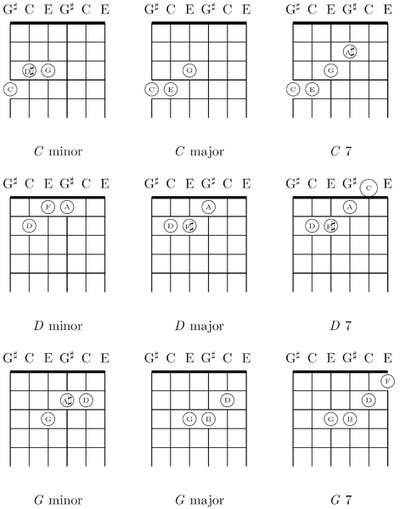 A chord chart is basically a grid that simulates the guitar fret board. As you can see, the vertical lines represent each string on the guitar while the space between the horizontal lines are designed to be the guitar’s frets. This grid is pretty much universal when looking at chord charts made for guitar, but there are exceptions and we will look at one at the end of this lesson. The other markers are not always the same, they are however always similar, so we are going to look at a couple of examples of those as well. In our original chord, the can see round-ish shapes, two which are outside the grid and three inside the grid. These marks are the map of the chord you wish to play. The black dots show where my fingers go on the fret board. 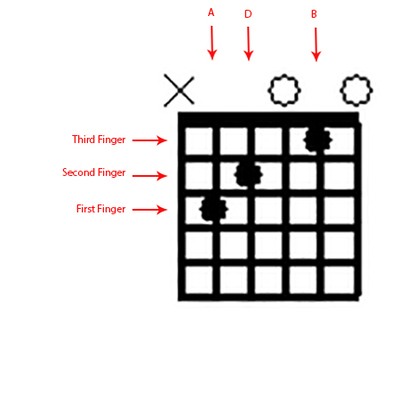 This chart shows a C chord, which is played by putting one finger on the third fret of the A string, a second finger on the second fret of the D string and a third finger on the first fret of the B string. 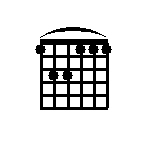 The two circles outside the grid mean that when you strum, those two strings are included in the strum. This is known as playing an ‘open’ string. There is also an X outside of the grid. This indicates that this string is not included in the strum at all. Now let’s look at some other examples, each with slight variations to the C chord we just examined. Here is a bar chord. In this chord chart, we are seeing all the same things we saw in the first example but this one has the addition of the large arc outside of the fret board. In this case, it indicates that all the notes on the first fret should be played with one barred finger which will push down all the strings. The other two notes, shown on the third fret of the A and D strings, would be played with a second and third finger. Whenever you see a symbol you don’t recognize, you should consult the book or website’s legend. Some websites or books will also have a legend for each song or lesson. Here is one more example showing nine different chords in an alternate tuning. This does not follow the usual rules concerning the grid, but it does show you how it differs. As you can see, the horizontal lines remain the same, indicating frets, the vertical lines however show different notes for each string. This means that the guitar has been tuned to different notes besides the standard EADGBE tuning. Now, if you don’t know what that means, that’s okay, this lesson isn’t about alternate tunings. What I do want you to look at is the dots that indicate where your fingers go. In this case, the dots tell you the name of the note where each finger is placed. For example, if you look at the chord on the top left, the C minor, one circle has a C in it, another has a D# and the third has a G in it. Those three notes combined make a C minor. That may sound confusing, it really just indicates where your fingers go on the fret board, just like any other chord chart. So now you have seen three different examples of chord charts and how they are similar. You should now be able to use chord charts to expand your library of chords when playing guitar. A new Scooby-Doo Movie, really?